Contents: 2001 [July - Dec.] — Boston Program, Govardhana Puja, Srila Prabhupada Tirobhava, Govardhana Hill Manifests, Gurukula boys visit Nagamangala, Radha Damodara Moves to Vermont, Devavision Project Moves, Editing for Devavision Underway, Installation of Sri Sudarsana Cakra, Radhastami, Vyasa-puja Celebration of BG Narasingha Maharaja, Srila Prabhupada Vyasa Puja, Janmastami & Janmastami videos, Boston Program, West Coast Saranagati Tour. See Events Index below for more events from 2005, 2004, 2003, 2002, 2001 & 2000. In Boston, on 21st December, Sri Sri Nityananda Avadhuta-Gauranga Sundara were bathed and installed in the morning by His Divine Grace amidst hari-nama-sankirtana led by Govardhana Das. In the evening invited guests had the fortunate opportunity to hear hari-katha from Srila Narasingha Maharaja who led the devotees in singing 'Sri Sri Prabhupada-padma-stavakah' by Srila Sridhara Maharaja and 'Srila Prabhupada Lila-smarana Mangala Stotram'. Srila Narasingha Maharaja briefly explained the history of these bhajanas and then spoke on the topic of the divine advent of Sri Caitanyadeva. All the guests, including many members of the Boston ISKCON temple, as well as the devotees from New Badarinatha Asrama in Vermont, then honoured Sri Sri Gaura-Nitai's mahaprasadam. 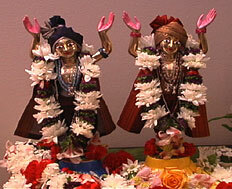 On November 16th the residents of New Badarinatha in Vermont celebrated the appearance day of Sri Giriraja Govardhana. 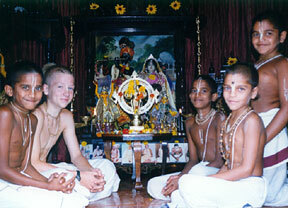 Simultaneously, in the early morning Sripada Visnu Maharaja awarded upanayanam to Vraja Kisora Dasa and Guru Mantras to Bhakta Priya Devi on behalf of Srila Narasingha Maharaja. The program commenced in the afternoon at the house of Sriman Jagadisvara prabhu and Dhira Lalita Mataji. 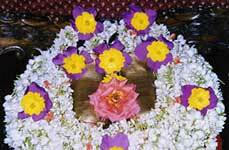 Dhira Lalita Mataji had spent much of the morning decorating the family altar with flowers and making a traditional Giridhari from cow-dung. 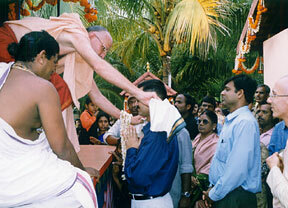 Many devotees and guests came specially for the program from Boston and the surrounding areas. The first part of the program was an abhiseka of Sri Giriraja by Sripada Visnu Maharaja and Svami BV Giri, during which Govardhana Dasa led the devotees in chanting 'Jaya Radhe Jaya Krsna' and the Maha-mantra. 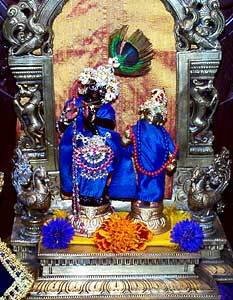 Sripada Visnu Maharaja then spoke about the pastime of Lord Krsna lifting Govardhan Hill. After the fire sacrifice was over, there was a bhoga-offering and an enthusiastic arati ceremony. This was followed by a sumptuous feast for all the devotees and guests. 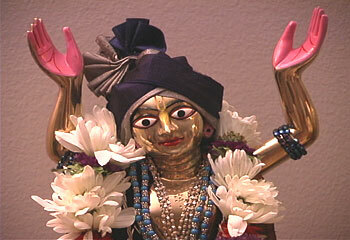 The next morning, the disappearance festival of Srila A.C. Bhaktivedanta Svami Prabhupada was observed by the devotees. Govardhana Dasa led the devotees in singing "Srila Prabhupada Lila-Smarana-Mangala Stotram" by Srila Narasingha Maharaja. 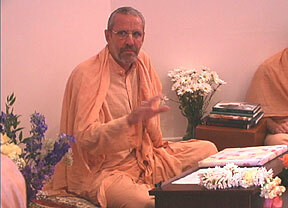 Sripada Visnu Maharaja spoke for some time on Srila Prabhupada and his contribution to the world. 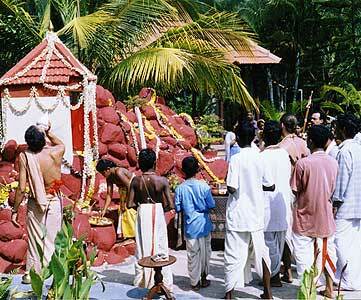 Later on, at midday, all the devotees offered puspanjali to His Divine Grace and guru-puja. After, all the devotees honored a maha-prasadam feast. On November 1st, the first day of the auspicious month of Damodara, the inaugural puja was performed to the newly completed Govardhana Hill by Srila Narasingha Maharaja. 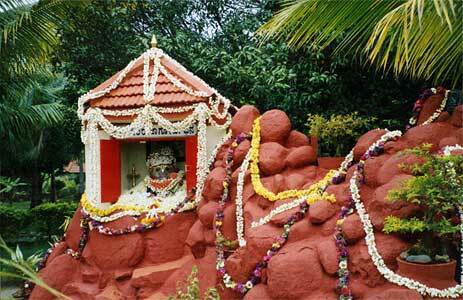 Decorated with bonsai plants and tulasi bushes, the hill stands majestically between Govinda Kunda and the yajnasala. 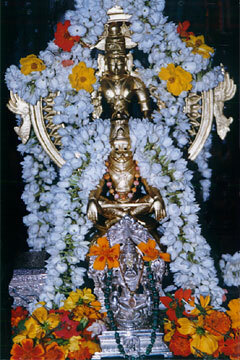 A large Govardhana-sila was placed in the shrine on top of Govardhana Hill and a maha-arati was performed and bhoga was offered to Giriraja by the matha residents. 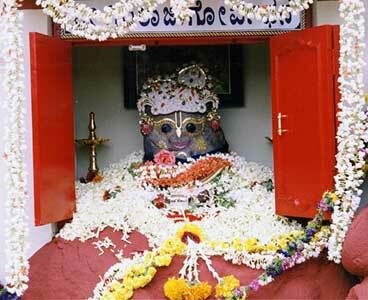 On the day of Govardhana Puja, a grand celebration was held, with many wonderful offerings to Govardhana Hill. In September, Sri Sri Radha Damodara and Sri Giriraja Govardhana moved from Govindaji Gardens in India, to New Badarinatha Asrama in Vermont, USA. As well as Their Lordships, Their servants Svami Bhakti Vijnana Giri, Sriman Govardhana Dasa and Gaura Gopala Dasa also traveled to Vermont to help establish a new temple complex there. The Devavision project has officially moved from India to New Badarinatha Asrama in Vermont, USA. With the Devavision Promotional introduction and the Kumbha Mela video finished, the team hopes to complete a new video on Srila Sridhara Maharaja and a lecture series by Srila Narasingha Maharaja in the next few months. Full-time editing for 'The Devavision Files' documentary series has begun. With the first cassette, 'Kumbha Mela - the Worlds Largest Act of Faith' already completed and on sale from Mandala Publishing, Srila Narasingha Maharaja hopes to present over 100 more informative videos for the devotee community and the general public. 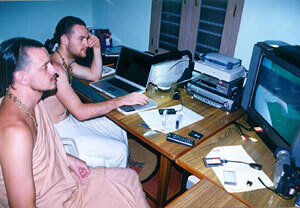 At present Govardhana Dasa and Svami B. V. Giri are busily sorting through, categorizing and editing over 140 hours of footage to create the introduction to the Devavision series. Location shooting for the next video commenced in early November. On 30th September, on the auspicious occasion of Sri Vamana Dvadasi, the Deity of Sri Sudarsana Cakra was installed at Govindaji Gardens by Srila Narasingha Maharaja. Whilst harinama was chanted in the kirtana-mandapa, Srila Narasingha Maharaja performed the complex procedures of Silpi-dosa-snanam (purificatory bath), netronmilinam (opening of the eyes) and prana-pratistha (formally requesting the Lord to be present in His arca-vigraha). 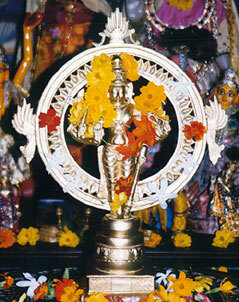 The Deity was placed on the altar along with Sri Vira Nrsimha and Sri Yoga-Nrsimha, the protecting Deities of the asrama. The auspicious appearance day of Sri Vrsabhanu-nandini, Srimati Radharani was celebrated with great enthusiasm at the Gita Upanyasa Mandir, Bangalore on 26th August. Srila B. G. Narasingha Maharaja presided over the function and spoke on the divine avirbhava in Vraja bhumi of Sri Radhika. He explained the conception of Hladini-sakti tattva and the importance of worshipping Sri Krsna along with His internal potency. The Bangalore devotees were also fortunate enough to get the special darsana of Sri Sri Radha-Damodara, the utsava-Deities from Govindaji Gardens, who had been brought by Srila Narasingha Maharaja for the auspicious occasion. 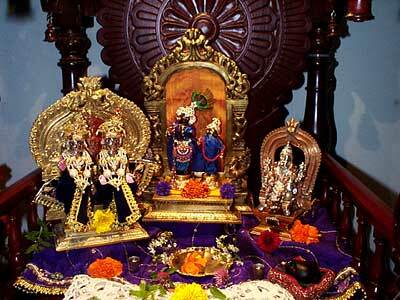 Sri Sri Radha-Damodara were bathed in auspicious items as Svami B.S. Madhava led the devotees in chanting the glories of Srimati Radharani. Svami B.V. Giri and Sriman Caitanya Dasa Adhikari then performed a special yajna for the pleasure of the Deities offering oblations to Sri Radha with Her 108 names and Sri, Bhu and Nila Suktas. 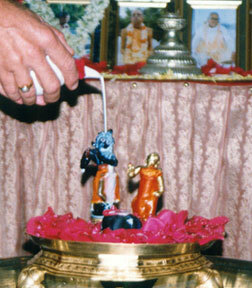 Srila Narasingha Maharaja performed the maha-arati and over one hundred guests had the good fortune to offer puspanjali to Sri Sri Radha Damodara. 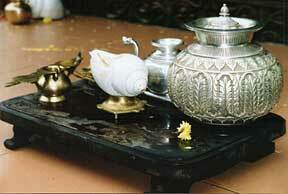 The function concluded with caranamrtam and prasadam being served to both devotees and guests. On Saturday 18th August, the appearance day of Sri Narasingha Caitanya Mathadipati, Srila Bhakti Gaurava Narasingha Maharaja was celebrated. At 10.00am disciples, friends and well-wishers gathered outside Srila Guru Maharaja's room and greeted him with harinama-sankirtana and the chanting of auspicious Vedic mantras such as sannyasa-suktam. Srila Guru Maharaja took his seat in the kirtana-mandapa and Svami B.V. Giri and Sriman Nanda Kisora Dasa performed the Adivasa rites invoking an auspicious beginning to the days proceedings. Srila Guru Maharaja then spoke shortly on the importance of Sri Guru in the life of a sincere disciple. Since there were so many offerings, Srila Guru Maharaja requested that the sannyasis read their offerings beginning with Sripada Visnu Maharaja. Sripada Visnu Maharaja has been Srila Guru Maharaja's constant companion for over twenty years and spoke in length on their association together, taking the opportunity to thank his dear godbrother for his guidance and friendship during that time. Svami B. 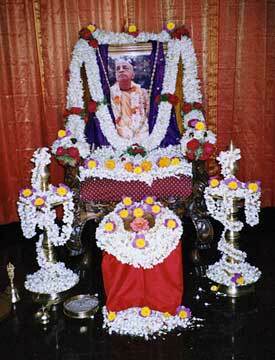 A. Avadhuta, Svami B. V. Giri and Svami B. S. Madhava also read glorifications to His Divine Grace. The program concluded with Guru Puja and puspanjali and a feast in honor of Srila Guru Maharaja was offered to the Deities. Srila Guru Maharaja has made it a point to read all the Vyasa-puja offerings that he has received and reply to each one individually. On 13th August, the divine appearance day of His Divine Grace Srila A.C. Bhaktivedanta Svami Prabhupada was observed by the devotees of Govindaji Gardens. 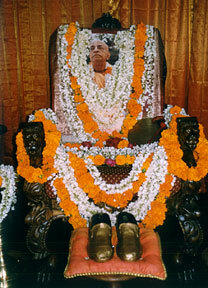 Srila Prabhupada's puspa samadhi was lavishly decorated with flower garlands, as was His Divine Grace's Vyasasana. 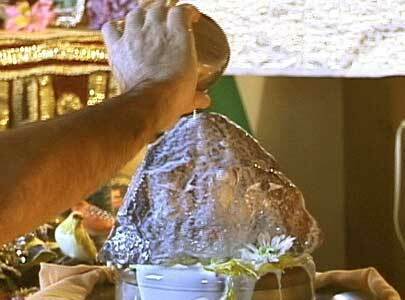 At midday, all the asrama residents gathered for guru-puja wherein Srila Narasingha Maharaja offered the Maha-arati to Srila Prabhupada while Sripada Bhakti Bhavana Visnu Maharaja sang 'Sri Guru Carana Padma' by Srila Narottama Dasa Thakura. During the kirtana, devotees offered puspanjali to Srila Prabhupada's shoes and after jayadhvami, mahaprasada was honored by all. The divine appearance of Lord Sri Krsna was celebrated at Govindaji Gardens in a grand style on 12th August. Srila Narasingha Maharaja, as well as Sripada Avadhuta Maharaja and Sripada Giri Maharaja returned from preaching in the west two days before in order to help organize the event. 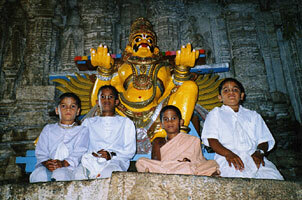 Srila Narasingha Maharaja spoke to a gathering in Boston. Many devotees from the local Iskcon temple, including the temple president, eagerly came to hear hari-katha from His Divine Grace. Srila Guru Maharaja spoke on a variety of subjects including Sri Guru Tattva, Gaudiya prayojanacarya Srila Raghunatha Dasa Gosvami, Rasa-Tattva, and the symptoms of real surrender to Sri Krsna and His representatives. After the class, Srila Guru Maharaja took the time to answer many important questions and all the devotees humbly requested Srila Guru Maharaja to come more often and speak in Boston. This two-hour lecture will be available on video in the future and the audio is now available from jagadish@sover.net. There is wonderful news we would like to share with you. As you may know, our Guru Maharaja, Srila Bhakti Gaurava Narasingha Maharaja recently returned from a 2 week preaching engagement, held at Saranagati Village - a most wonderful community of devotees, outside of Vancouver, Canada. Sriman Harivilas Prabhu, the GBC of the region, wrote a letter glorifying Maharajas preaching service and welcomed Maharaja in his visit to Canada. Gopal Krishna Maharaja and Bhakti Marga Swami, the other GBC's of the region, welcomed Maharaja similarly. 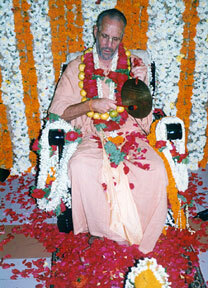 Srila Guru Maharaja went by invitation to Saranagati, also stopping by request at Sripad Tripurari Maharajas project in Mendicino county CA, to Sriman Agnideva Prabhu house in Eugene Oregon, and to Rupa Raghunatha Prabhus house in Vancouver. 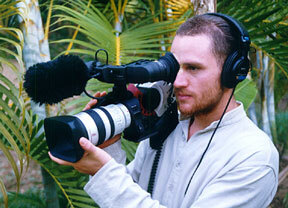 Sriman Govardhan Prabhu, traveling with Srila Guru Maharaja, did the service of filming Maharajas classes throughout the whole trip. More than 33 hours of footage was caught on tape. These darshans will be available through Mandala Media shortly. Departing from Sriman Ramdas Prabhus home, whom I would like to mention here, graciously sponsored our entire journey, we arrived at Sri Audarya Dham, the beautiful ashram of Sripad Tripurari Maharaja, tucked away into the hills and redwood trees of Mendicino county. A wonderful day was spent there as Srila Guru Maharaja and Srila Tripurari Maharaja spoke about their realizations after a life of service under Srila Prabhupada in Krishna Consciousness. Events Index by year — from latest to earliest. 2008 [August] — New Books Published, Appearance of Srila A.C. Bhaktivedanta Swami Prabhupada, Appearance of Srila B.G. Narasingha Maharaja, Janmasthami Celebrations 2008: Sri Narasingha Caitanya Matha and Kaliya-Mardhana Krsna Ashram. 2007 [June-September] — Radhasthami, Vyasa Puja Srila Prabhupada, Vyasa Puja Srila B.G. Narasingha Maharaja, Janmasthami 2007, Renovation of Srila Rupa Goswami Prabhu's samadhi finished, Bhajan Kutira Renovation started. 2007 [March-May] — Sri Narasimha-caturdasi, Chandan Yatra, Srila Rupa Goswami Samadhi Reconstruction Progresses, Italy Center Opens [Srila Prabhupada Seva Ashram], Gaura Purnima observed at Govindaji Gardens. 2007 [February] — Srila Rupa Goswami Samadhi Reconstruction in Progress, Prabhupada Returns to his Rooms at Radha Damodara Temple, Bhumi Puja at Srila Rupa Goswami's Samadhi. 2007 [January] — Appearance of Bhaktisiddhanta Prabhupada, visit of Jayadvaita Swami, Visit by Sripada BB Bodhayana Maharaja, Appearance of Lord Nityananda, Marriage of Drdha Vrata and Gandarvika, Vasant Pancami, Visit of Guru Prasad Maharaja. 2006 [October-December] — Srila Bhaktisiddhanta Disappearace, Srila Prabhupada Disappearace, Govardhana Puja, Srila Bhakti Raksaka Sridhara Deva Gosvami Appearance. 2006 [August-September] — Srila Bhakti Promoda Puri Gosvami Appearance, Radhasthami, Visiting Friends in Europe and the USA, 60th Appearance of Swami BG Narasingha, Vyasa Puja of Srila Prabhupada, Janmasthami 2006. 2006 [January-April] — Hare Krsna Ashrama Inauguration Festival (Mulki), Gaura Purnima Celebration, Vasant Pancami Observance, New DVD Film Biography of Srila Bhaktisiddhanta Sarasvati Thakura, Installation of Kaliya Mardana Krsna Deity, Visit by Sri Nandanandana, Guru Prasad Swami and Swami B B Bodhayana. 2005 [August-Dec.] — Visit of Paramadvaiti Maharaja, Anniversary of Sri Narasingha Chaitanya Matha, Karttika, Govardhana Puja, Srila Prabhupada Disappearance, Appearance of Bhaktivinoda, Radhasthami, Reprinting of Follow the Angels and In Search of the Ultimate goal of Life, Srila Prabhupada Vyasa Puja, Srila Narasingha Maharaja Vyasa Puja, New Video: Srila Bhaktisiddhanta Biography: The Universal Teacher, New book by Srila Sridhara Maharaja entitled Encounters With Divinity, Sri Krsna Janmastami Mahotsava. 2005 [May - July] — Jagannatha Ratha-yatra, Appearance of Lord Narasinghadeva, Candana-yatra, Appearance of Srila Gadadhara Pandita Gosvami. 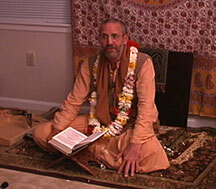 2005 [March-April] — Filming for Srila Bhaktisiddhanta video, Gaura Purnima Festival, Maha-Sivaratri, Srila Bhaktisiddhanta Appearance. 2005 - 1 [Jan-Feb.] — Nityananda Trayodasi, Vasanta-pancami, Installation of Lord Jagannatha and Gaura-Gadadhara, Ashrama Publications & Videos, Kaliya-Mardana Krsna Asrama, Kannada Songbook Printed. 2004 [Nov. - Dec.] — Disappearance Bhaktisiddhanta, Ten Year Ashrama Anniversary, Disappearance Srila B P Puri Gosvami, Disappearance Gaurakisora, Disappearance Srila Prabhupada, Karttika Masa, Govardhana Puja, Srila Sridhara Maharaja Appearance, B B Visnu Appearance. 2004 - 4 [Sept. - Oct.] — Appearance Day of Srila B P Puri Gosvami, Evolution of Theism reprinted, Sannyasa of Srila Prabhupada, Appearance of Bhaktivinoda Thakura, Radhasthami, Srila B G Narasingha Appearance, Srila Prabhupada Appearance, Janmasthami. 2004 - 3 [April cont.-August] — Visit of Vijayashankar MP, Visit of Dr Rajaram, Painting of Narasinghadeva's temple, Himalayan Pilgrimage video, Library & Devavision Studio opening. 2004 - 2 [March-April] — Narasingha Caturdasi, Candana Yatra, Deities of sannyasis, new Goshalla, Gaura Purnima, Salagrama-hara, Srila Prabhupada Samadhi painting. 2004 - 1 [Jan-Feb.] — Sivaratri, Appearance Bhaktisiddhanta, Nityananda Trayodasi, Kirtan Hall Artistry, Visits of BV Narasingha & Guru Prasad Svami, Vasanta-pancami, Publication of Prakrta-rasa Aranya Chedini, Kumbha Mela on New Zealand TV. 2003 [Sept - Dec.] — Tirobhava of Srila Bhaktisiddhanta, Foundation of Library & Multimedia Studio, Yoga-Narasimha Tilaka, Video Darshan of Yoga-Narasingha, Installation of Sri Sri Laksmi-Narasingha, Srila Prabhupada's Tirobhava, Karttika, Govardana Puja, Avirbhava of Srila BR Sridhara Deva Gosvami, Appearance of Srila BB Visnu Maharaja, Radhastami. 2003 - 1 [August] — Janmastami and Installation of Yoga-Narasingha, Srila Prabhupada's Vyasa Puja, Vyasa Puja of Srila Narasingha Maharaja. 2003 - 2 [May-July] — Puri Ratha Yatra, Tumcur Science Program, Bhoga Narasingha and Yoga Narasingha, Narasingha Caturdasi, Candana Yatra. 2003 - 3 [Jan-April] — Gandaki Muktinatha, Gaura Purnima Festival, Varadaraja in Kondaggi, Laksmi-Narasimha in Javagal, Yoga-Narasimha in Belavadi, Mahabalipuram, Pakshi-tirtha, Vasanta-pancami, Wedding of Govardhana and Krsna-priya dd. 2002-2 [June - Dec.] — Srila Prabhupada Deity, Vrndavana Temples, Subramanya Tirtha, Karttika Masa, Govardhana Puja, Srila Prabhupada's Tirobhava, Subhaga Svami visits, Kitchen Ground-breaking, Sridhar Swami visits, Goshalla Completed, Vyasa Puja of B. P. Puri Goswami, Radhastami and Babaji Initiation, Narasingha Maharaja Vyasa-puja, Janmastami, Srila Prabhupada's Vyasa-puja, Audarya Asrama program and San Francisco Ratha-yatra. 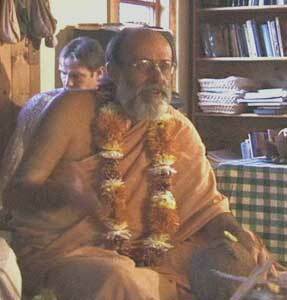 2002 [Jan. - May] — Narasingha Jayanti in Vermont & Govindaji Gardens, Gosala Foundation, Pejavara Svami visits, Gaura Purnima in Vermont & Govindaji Gardens, Guru Prasad Swami Visits, Jayadvaita Maharaja visits. 2001 [July - Dec.] — Boston Program, Govardhana Puja, Srila Prabhupada Tirobhava, Govardhana Hill Manifests, Gurukula boys visit Nagamangala, Radha Damodara Moves to Vermont, Devavision Project Moves, Editing for Devavision Underway, Installation of Sri Sudarsana Cakra, Radhastami, Vyasa-puja Celebration of BG Narasingha Maharaja, Srila Prabhupada Vyasa Puja, Janmastami & Janmastami videos, Boston Program, West Coast Saranagati Tour. 2001 [Jan - June] — Cira-dahi Mahotsava, Pandava Nirjala Ekadasi, Calf born, Meeting with Asta-matha Swamis in Udupi, Candana-yatra, Narasingha Caturdasi, Ramanujacaryas Appearance, Gaura Purnima, Tripurari Maharaja visits, Tour to Subrahmanya, Halebid and Udupi, New Center and Deities in Bangalore, Sivaratri, Nityananda Avirbhava, Deity chamber decoration, New Calf, 2001 Kumbha Mela. 2000 [Jan - Dec.] — Govardhana Hill to Manifest, Copper Plate Project, Installation of Radha-Damodara.